The Papertrey Ink team is back again today with another group blog hop to show some projects made with the new Mat Stack 5 dies and stamps. These will be available on the 15th! They are so versatile...as you'll see from the team. I'm sure of it! The Mat Stack 5 dies and stamps are perfect for a little Valentine pocket! 1. Die cut two Mega Mat Stack 5 pieces out of Raspberry Fizz felt. Stitch them together on sides and bottom, leaving top open for candy. 2. Die cut one Layerz Mat Stack 5 piece out of white cardstock. With the Mat Stack 5 stamps, stamp a houndstooth frame with Raspberry Fizz ink. Ink the edges of the cardstock with Chamomile ink. 3. Stamp the flowers from Simply Jane stamp set in Spring Moss ink. 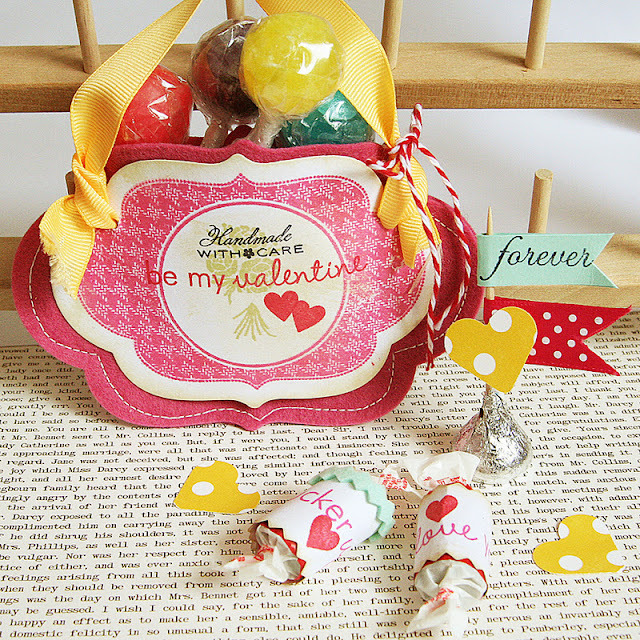 Stamp "Be My Valentine" and the hearts in Pure Poppy ink from the Tremendous Treats: Valentine stamp set. 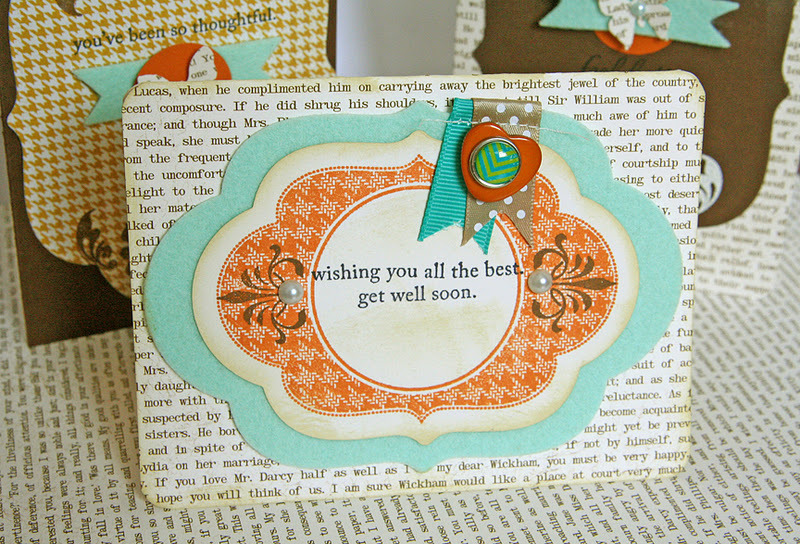 Stamp "Handmade with care" using the Handmade Hodgepodge stamp set with True Black ink. 5. Punch 2 holes to tie on a ribbon handle. 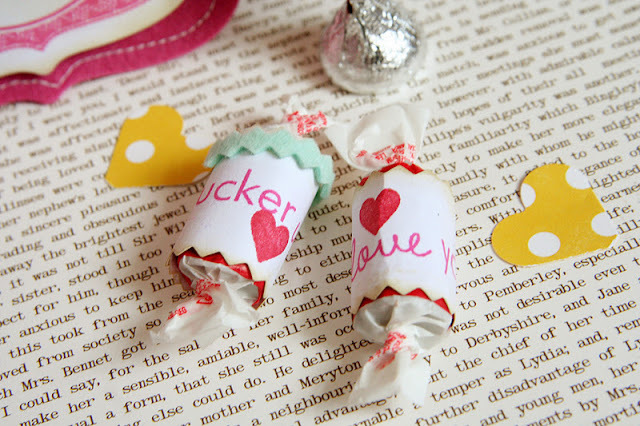 You can wrap little candies with stamped sayings like I did here. (They say "pucker up" and "i love you".) 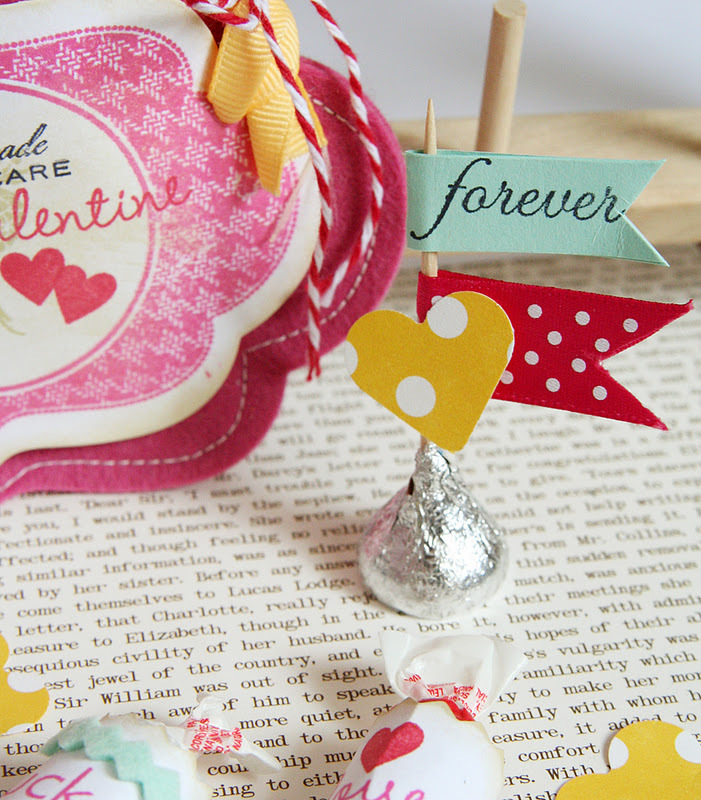 Or make little flags in Hershey Kisses with a toothpick! How about wrapping the stick of a lollipop with a handmade flag as well and adding a special note to it! I stamped "forever" with a Mat Stack 5 stamp. To make the flag, I simply folded a strip of paper in half and trimmed the end in a V shape with my scissors. Other: Raspberry Fizz Dotted ribbon and Harvest Gold ribbon by Papertrey Ink, twine by the Twinery. This card set, also made with the Mat Stack 5 dies and stamps, has a little bit more of a masculine feel with the blue/orange/brown color combo. 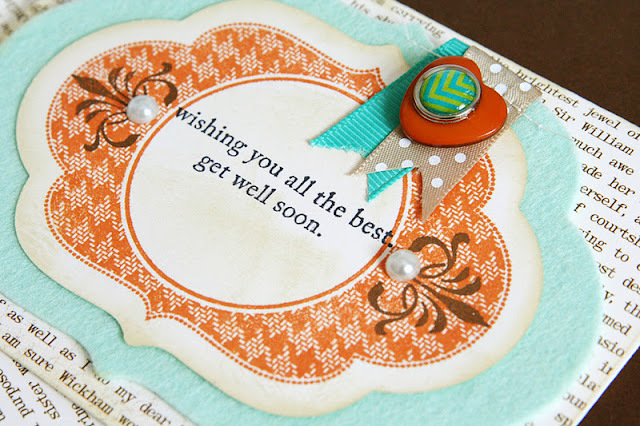 I used the Mega Mat Stack 5 die to cute the large shape from Dark Chocolate cardstock on the Feel Better card. Then I used the same large die to cut the background for the second card using some My Mind's Eye paper. The sentiments are from Mat Stack 5 also. The card below uses both the Mega Mat Stack 5 die with Aqua Mist felt and the smaller Mat Stack die with cardstock. 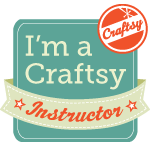 Here you can see the Canyon Clay ink and a Canyon Clay button - also NEW kraft ribbon! 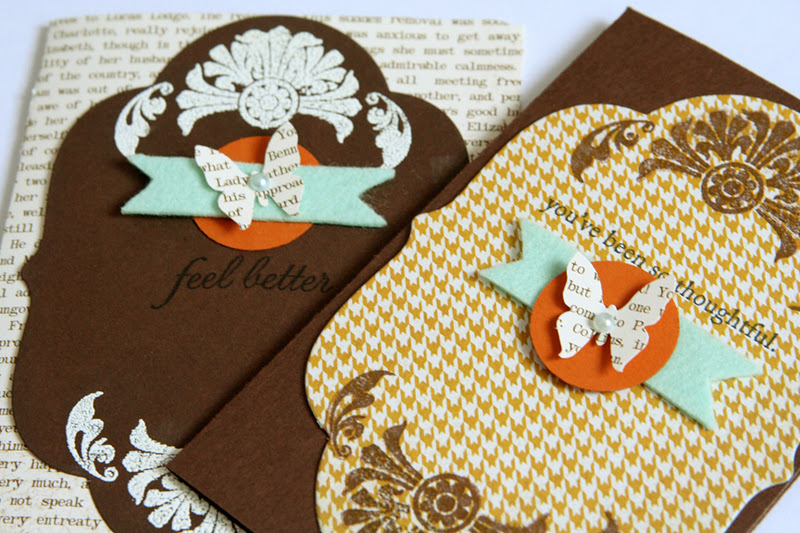 The text paper is a new paper pack called Dearest Jane. Hawaiian Shores ribbon, Martha Stewart butterfly punch, circle punch. Thank you for visiting! Please stop over to the other girls' blogs to see how they used Mat Stack 5. Oh my what a cute little Valentine pocket! And the colors for the "manly" card are gorgeous!! Love, love , love your projects. I follow your blog every day and you always amaze me. Love these! Love the candies and the adorable Hershey Kiss! wow these are all amazing...love your creativity...thanks for sharing. Oh those cards look so classy! So many uses for the die! The Valentine pocket is so cute. Wow! So cute! I don't know anyone that wouldn't want to receive something this cute for Valentines day! I really love your style. I like the way you combine colors and patterns effortlessly. You're definitely becoming one of my favorite designers. You're making me think of creativity in a different way. Love your choice of color combinations. These are gorgeous! Ohhh...so much fun. 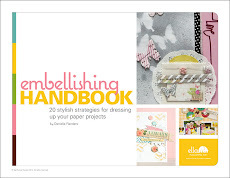 I love all of your happy, sweet projects Danielle! I love the Hershey Kiss flag, and the little wrapped candies! Love Mat Stacks! Cute, Cute! Thanks for sharing! I love to come visit you Danielle, your work is awesome and your projects very inspirational. Thanks so much for sharing your ideas with us. Have a lovely evening. Wowsers! Awesome projects! Love your color choices... wish I had an eye for combining colors like you! Such SWEET Valentine pockets! Cute, Cute, Cute!! love those die cuts! It's hard to do masculine and your color combination really works well for that. Great job! YOU are a genius with that punch. Who would have thought to do that!?! Thanks for sharing. Both of these projects are SUPER cute!!! Thank you so much for sharing. Pink Paislee CHA sneak peeks begin!